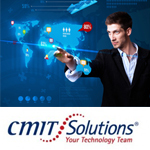 CMIT Solutions provides IT services to small and medium B2B businesses. The company has a broad menu of technical support and IT services. CMIT has a goal of helping your small business run smoothly and be to prepare for possible IT problems which could arise. Their clients average in size from 5 to 99 employees. Whether you’re looking for a disaster recovery plan, want to avoid expensive computer problems or a preventative maintenance solution to keep IT costs predictable and avoid the dreaded “off line”, CMIT technical support experts will meet with you to understand your business, and your IT needs, so that they can find the solution that’s right for you. CMIT Solutions caters to Veterans. The franchise currently offers a 20% discount on their franchise fees. CMIT has approximately 12% of its franchisees whom are Veteran owners.